Stanley's West Broadway is a long poem, composed over the past decade, following on Stanley's other long city poems, "San Francisco's Gone", "Terrace Landscapes", and Vancouver: A Poem. Like those poems, West Broadway has embedded in it shorter verse poems that stand on their own. Bowering's Some End is a suite of thirty–two poems tracking his recovery from a near fatal cardiac arrest in 2015. Throughout, Bowering's wit, his command of the idiom, and his ironic self–awareness shine through as powerfully as ever. George Bowering is a two–time winner of the Governor–General's Award for Poetry, and was Canada's first Poet–Laureate. His most recent books of poetry are The World, I Guess (2015) and Teeth (2013). 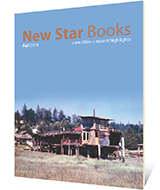 New Star Books recently re–issued his 1977 novel A Short Sad Book.